I don’t know about you, but I absolutely love Overnight Oats! Why? Because when I am running late to work (which is always), I can just grab it and go! Plus, it tastes delicious and is a nice change from the regular run-of-the mill oatmeal! These overnight oats take a little time in the morning since I layered it and made it all pretty, however you can skip the layering and just put it all in a jar! Layer oats, peanut butter, and cottage cheese. Top with blueberries and chopped peanuts! Mix all the ingredients together EXCEPT blueberries and refrigerate overnight. Mix together each individual layer until smooth. In the morning you can either eat as is topped with blueberries, or place the overnight oats and the blueberries in a blender/food processor and blend until creamy and blueberries are blended in. Can easily be halved for 1 serving. However, it is nice to have 2 breakfasts already made! Can use regular peanut butter instead of peanut flour. Can skip all the layers entirely and just have the oat layer! It is delicious by itself! 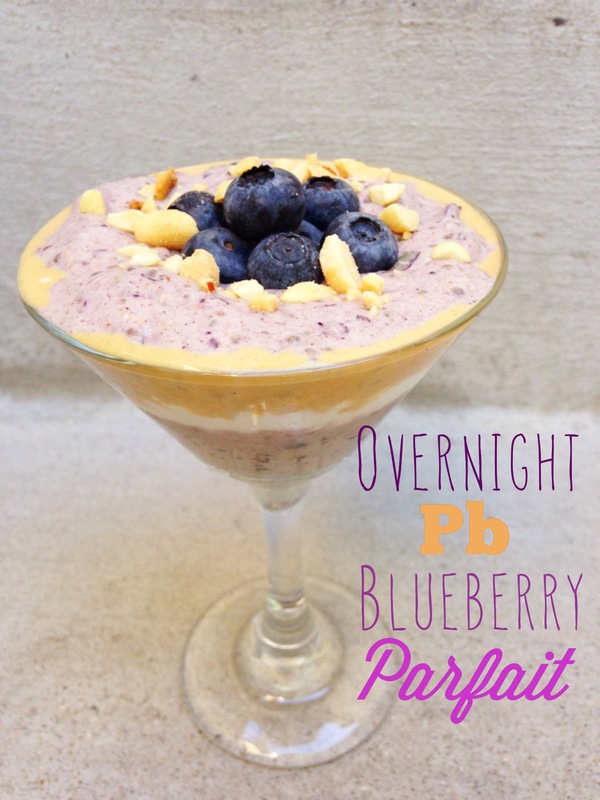 0 Responses to "Overnight PB Blueberry Parfait"
Hey, thanks for the recipe. I’m having trouble finding your other overnight oat recipes that are on your Instagram account. This was the only one I could find. Can you please help me out? I’m looking for your latest recipe of ‘Vegan overnight oats’. Thanks! I am posting another overnight oat recipe today on my blog Also the Vegan overnight oats are on my instagram if you go to the top and press “load all comments” it will be in the comments. Cool, I look forward to it! Sorry I must have blindly missed the recipe before. Got it now. Thanks! I cannot wait to try this! Your recipes are so fabulous!! Thank you so much!